The Middle Eastern culture has always been intriguing to Westerners. There has been ongoing conflict with a few of the countries located in that region of the world, such as Iraq and Iran. Perhaps you recall the Persian Gulf War, which was well-televised in the beginning of the nineties. This specific combat was concluded with the Highway of Death, which in a map can be easily located as Highway 80 and Highway 8. Kuwait City happens to be on the southern tip of Iraq, facing the Kuwait Bay. Highway 80 travels West on a map, and later turns North, heading towards Basra. The section that was heavily attacked was later known as the Highway of Death. 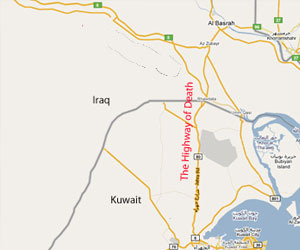 If you take a good look at the Highway of Death Map, you will notice that Kuwait and Iraq are neighboring countries. It will almost seem that Kuwait was part of the Iraqi territory. There has always been some type of disagreement between them, especially after Iraq was in debt with Kuwait and couldn't repay them. In August of 1991, Iraq decided to invade Kuwait alleging that they were stealing from their oil. They attempted to overpower the Kuwaitis and to make the country an additional province for Iraq. However, Kuwait was not alone since the U.S., along with the support of the U.N., was fighting the Iraqi insurgents. The Highway of Death actually connects these two countries, and it was determined that it would be a great opportunity to stop the invasion and war once and for all. Nowadays, there is still conflict between Iraq and the United States. However, since Kuwait and the U.S. have maintained a good relationship, it's a lot easier to get to the Highway of Death from Kuwait. Moreover, the World Bank has recognized Kuwait as a major non-NATO ally of the U.S. In the northern area of the country, you will find Kuwait City, which happens to be the capital of the republic. This is the city of origin for Highway of Death or Highway 80. From there, you can drive on the highway until you reach the Iraqi border. Once in Iraq, Highway 80 is also known as Jahra Road and it passes by Safwan until it reaches the city of Basra, Iraq. The Highway of Death could be seen from above at the time of the incident, and it depicted a map of destruction. There were numerous vehicles abandoned by their fleeing passengers, resembling a horror movie where zombies are walking the streets. Many Iraqi insurgents were killed in the combat, and today, there are still pictures of the aftermath. Keep in mind that Highway 80 was not called Highway of Death until after the attack. The pictures themselves will demonstrate why this name was chosen. Ironically enough, in the 2003 U.S. invasion of Iraq, the same highway was used by the American troops. Today, Saddam Hussein is gone but the Highway of Death still remains.